What is the difference between Fussy Vegan Scan Pro and Fussy Vegan Scanner? - Search weekly catalogue specials from Major Supermarkets (currently only available in Australia) by either brand or supermarket. - Search EU/AU & NZ approved additives as well as ingredients. - Manufacturer vegan status - The percentage of products made by the manufacturer that are vegan. - Manufacturer palm oil status. - More features will be added in the near future. What is the current version of the app? The current version of the app is 1.3 for iOS. The app is not currently available on Android. How many products do you have listed in the app? Our database currently has just over 70,003 products as of 12.04.2019 and we are continuing to add between 100-500 products per day on average. 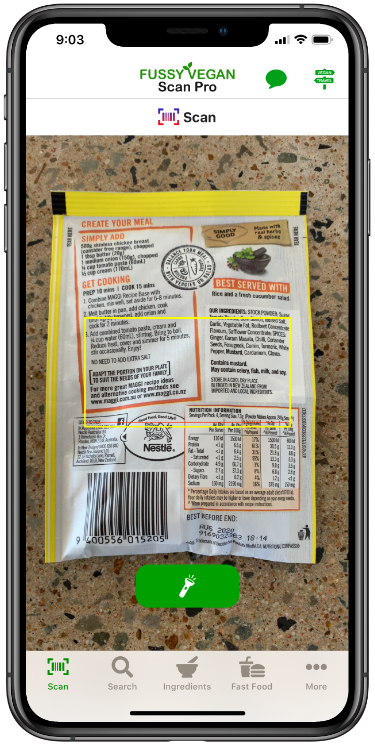 How many additives and ingredients do you have listed in the app? Our database currently has just over 1,100 products as of 12.04.2019 and we are continuing to add ingredients regularly. What weekly specials do you add to the app each week? We currently add the weekly catalogue special for Coles and Woolworths. 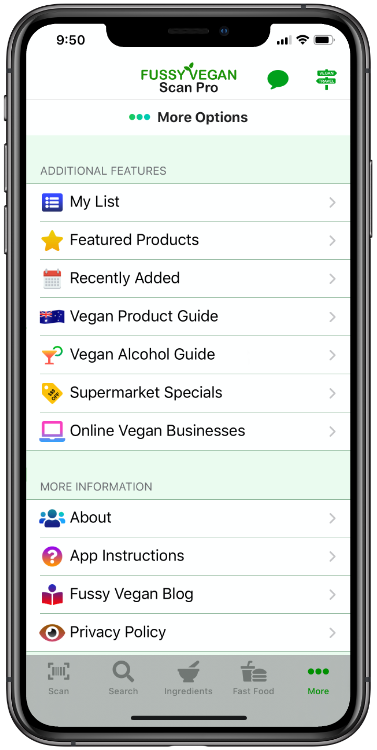 Please note that we only add specials for products that we have listed the vegan status of in our app database. For example, we have not added batteries to our app database yet, so we have not listed any specials on batteries. We also do not list any fresh fruit and vegetable specials, as the prices for these items fluctuates too much between regions and states. Please also note that whilst we try and filter the specials we add to only include vegan friendly products, please ensure that you check the vegan status of any specials listed before purchasing. How accurate is the data in the app? We carefully research every ingredient in all of the products in our database to ensure accuracy. We are human though, so if you think you have found an error, please contact us so we can look at updating our database if needed. What countries will the app scan products from? 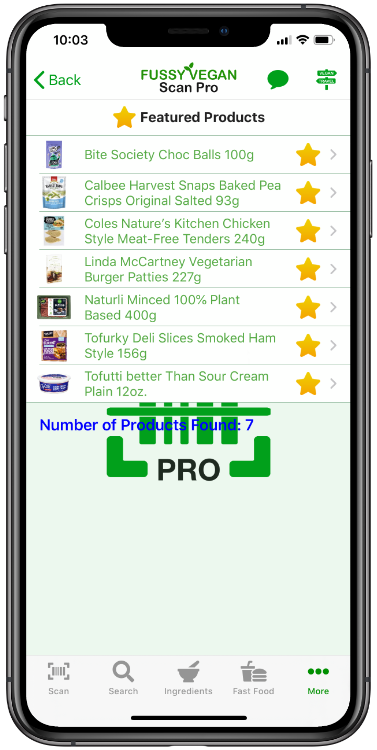 At present, our app will scan products available for sale in Australia, New Zealand, United States and United Kingdom. We will be expanding the app in the future to include products sold in other countries. How do you determine the vegan status of a product? When we first started developing this app, we thought that this was an easy answer. What we have learnt is that the answer to what is considered vegan is far more complicated. We have seen a lot of different interpretations as to what some consider to be vegan. We have also learnt that regardless of what definition we go with, it will be met with both agreement and disagreement. 1. The product contains no animal ingredients. There is absolutely no exception to this rule. If it has any form of animal derived ingredient in it, the product is not vegan. 2. No animal derived ingredients have been used in the manufacturing or production process. For example, using gelatine to filter apple juice for clarity would be considered NOT VEGAN. 3. The product or any ingredients in the product have not been tested on animals. This is not as simple as we once thought it was. At some stage in history, we strongly suspect that just about every ingredient used in food, health, beauty, cleaning, stationary products and so on has most likely been tested on animals by someone. We have to have a line somewhere, otherwise there is just chaos and confusion. Our line is that if the manufacturer has either directly tested or been willingly compliant in testing any of the ingredients of the product or of the whole product itself then the product is NOT VEGAN. For example, selling beauty products in China when the manufacturer would know that under Chinese law, the government is going to test their product on animals would be considered willingly compliant in animal testing and NOT VEGAN. The same would apply if a manufacturer paid a third party to do animal testing for them. The animal testing rule will apply to the specific product and not the company as a whole. This means that if a particular product was tested on animals but another product by the same manufacturer was not, then we may still consider the product that was not tested as vegan. All products, whether food or beauty products will be assessed the same. Our observation of the greater vegan community (and yes we are generalising here) is that there seems to be conflicting standards when it comes to food products and health/beauty products. What we mean is that whilst Unilever sells some health/beauty products in China, the consensus is that vegans should not buy ANY Unilever health/beauty products. At the same time, some of those same people that will not purchase Unilever health/beauty products are quite happy to purchase a vegan Magnum or vegan Cornetto, which are both made by Unilever. We have seen this with multiple different brands. Again, we are generalising here, but that is certainly the observations we have seen. We have previously labelled our health/beauty products based on the whole brand, rather than the individual product. Moving forward, we will label and assess based on the individual product, as we do not feel it is appropriate to have one standard for food products and a different one for health/beauty products. 4. In regards to animal ingredients being used in pre harvest processes, such as fertiliser, we have determined that it is currently not feasible to accurately verify this for all or even most products, as most manufacturers would source their plant based ingredients from multiple sources, which can often equate to hundreds of different farms just for one ingredient in one product. To properly determine this, there would need to be in place something similar to RSPO certification for palm oil or Fair Trade for chocolate. This is certainly not something we would have any capacity to establish or even the inclination to do, as it is far outside our business model as vegan app developers. There are readily available vegan friendly fertilisers available and in instances where we are able to verify the use of fully vegan fertilisers, we will add this information to the product information page in our app. At the same time, if we come across an instance, for example the winery that posted a photo of 800 cow horns in the ground and their subsequent ignorance of how that image may offend many in the vegan community, we will make a case by case determination as to whether we list that product as vegan or not vegan. Going back further into pre harvest processes, such as land clearing, is also not currently feasible for most products. The reality is that every single parcel of land being used to grow agricultural products for human consumption has most likely been cleared and with that clearing the loss of habitat or even death for any number of animals. 1. We have not yet been able to verify the vegan status of the product. 2. 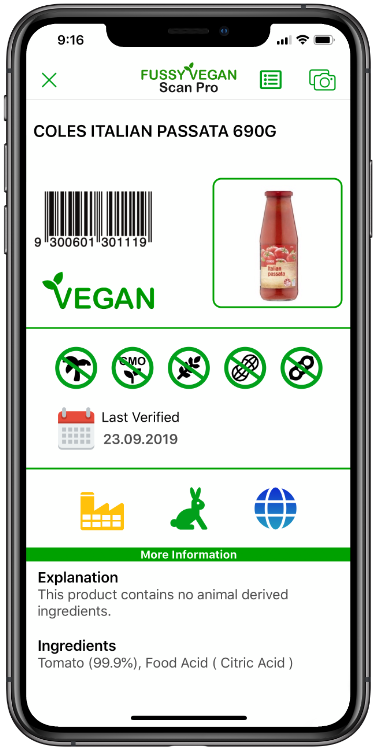 We have been able to partially verify the vegan status, ie we know there is no animal ingredients, but we have concerns about whether the product has been tested on animals or not. 3. Other instances where we are not comfortable in putting the status as either vegan or not vegan. 1. The product contains any animal derived ingredients, regardless of the amount in the product. 2. The product is or has been tested on animals. Products that have been available for a long time and may have been tested in the distant past but have not been tested in recent times will be assessed on a case by case basis. 3. Other factors that we have determined warrant a NOT VEGAN status for the product. Remember, that we always list an explanation along with the vegan status as to why we consider that product a particular status. 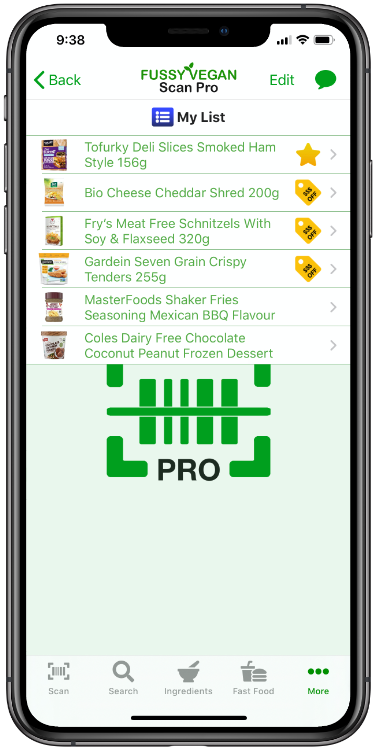 Some app users will be happy to go on our recommendation as to whether a product is vegan or not and that is great. Other app users may choose to make their own determination based on the information we have provided, and that is fine too. Remember our app is a guide and not the law. Each app user can make their own decisions on how to interpret the information in our app to suite their own ethical beliefs. What is your stance on palm oil? As palm oil itself is considered vegan, we do not take into account palm oil when determining the vegan status of a product. However, we do understand that some people may have issues with palm oil due to environmental and ethical factors. We do support the use of RSPO certified sustainable palm oil and we have done a blog post which details our views on palm oil, which you can read by via the link below. What is the Animal Testing Status for a company mean? NO ANIMAL TESTING - This company does not do any animal testing and does not request any animal testing to be completed on its behalf. This includes not being willingly compliant with having their product tested by third parties, such as government animal testing in China. UNKNOWN - We have not been able to ascertain if this company does any animal testing. CAUTION - This company does not do any animal testing, but may use ingredients that are sourced from third party suppliers that do animal testing. DOES ANIMAL TESTING - This company still does animal testing, and or requests third parties to do animal testing or is willingly compliant in third parties testing their products on animals. An example would be a company that chooses to sell beauty products in China, knowing that under current Chinese law, that product will be tested on animals. There are many companies that choose not to sell their beauty products in countries that require animal testing. Why did I see a product listing in your app that was listed as VEGAN, but the company animal testing status was DOES ANIMAL TESTING? We explain this in detail above under the vegan status explanations. To summarise, the vegan status of a product is based on the individual product, not the company as a whole. Those that choose not to purchase any product from a company that still does animal testing can use the Animal Testing Status to provide them the information they need to make an informed decision based on their own ethical beliefs. Why do you not use the term cruelty free? The term cruelty free is generally used as a label for products that do not test on animals. Whether that product contains any animal derived ingredients is not a factor in determining if a product is cruelty free. Our stance is that a product cannot truly be cruelty free if animal ingredients are used, thus we do not use the cruelty free label in our apps. 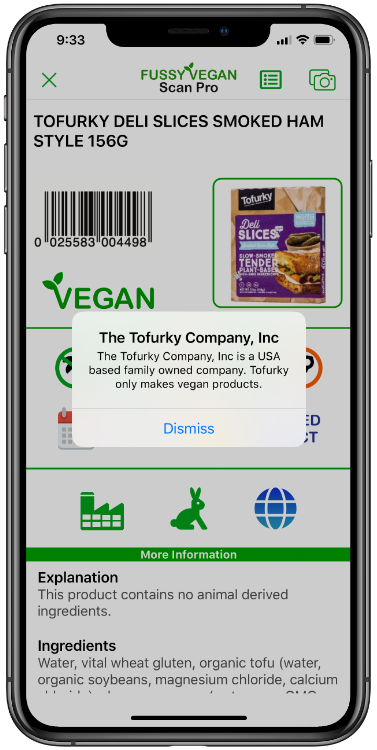 Please find a description of each section of the Fussy Vegan Scanner app below. Please read through this page before emailing any support requests to us to see if we have already covered your enquiry below. If your enquiry is not covered by the information on this page, please email us and we will respond to your request, usually within 24 hours. The app opens directly to Product Search page by default. 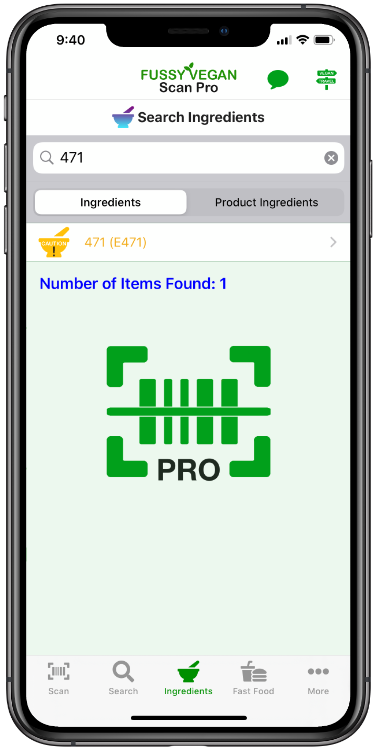 From here, you can either manually search for a product by either brand name, product name or barcode. You can also tap on one of the icons at the bottom of the screen to choose another option. 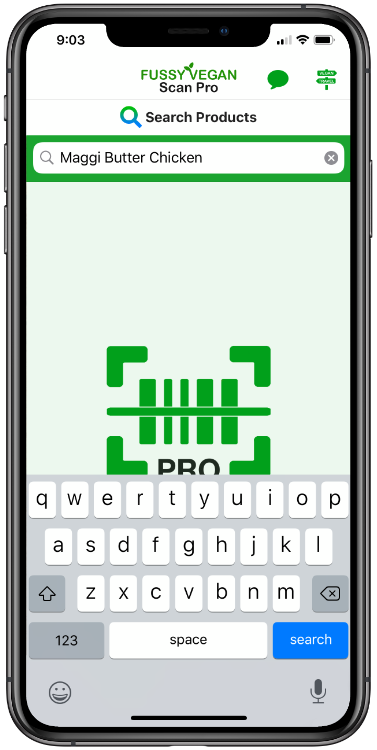 Tap on the scan icon to scan the barcode of a product. Simply position the yellow rectangle over the barcode of a product to scan. If no product is found that matches your scan or manual input, then the search results page will simply show no listings. If you are scanning a product, you will know if the app scanned the product correctly if the search results page appears, even if nothing is listed. If they app did not scan the product, then the app will stay on the scan page. The product details page will display relevant information about the product to enable you to make an informed decision in regards to purchasing that product. You can also save the product to your favorites list by tapping the green star at the top right of the screen. You can view all of the products that you have saved to your favorites list here. You can delete any products from your favorites list by tapping the edit button or by left swiping an entry. Searching for ingredients and additives is exactly the same as manually searching for a product. Search for current specials in major Australian supermarkets by either brand name or supermarket name. Tap on one of the results to see teh current specials available for that product or brand. The About page shows information about the app, including the version of the app. Brings you directly to the app store to leave a rating and or review of our app. Opens your default email service to send us an email. Brings you directly to this app support page. Brings you directly to our Blog page. Brings you directly to the Fussy Vegan Website. Brings you to the app store link to our developer page on the Apple App Store.